The mist was floating over the wide river and covering the peaks of the surrounding mountains, as we started walking this morning. The forecast had called for another rainy day, but for most of our walk today it just drizzled, and later on in the day, the rain on the roads dried up. When we woke up in the morning in our old and charming Ryokan, we quickly returned the extra futons we had borrowed the night before, to the adjacent room. We had breakfast in the next door building, sitting in a private room upstairs. We tried the local speciality of a local tiny fish which is ground up into a paste, formed into a rectangular cake and then deep fried. It was grey and it wasn’t delicious to my tastebuds, but I have reached a point in which I can hardly eat multiple dishes of seafood for breakfast. Jules and I talked about the fact that in a long pilgrimage, you really get to see clearly how much we are creatures of habit, seeking our familiar comforts, and how attached we are to certain things. We also noticed that we are constantly evolving and changing, and we remarked about how in the past, we wouldn’t have stayed in a place without a private toilet, and how in the past we spent so much time researching places to stay, things to do or see…..
Now it all seems like unneeded obsessions of people who are constantly second guessing their choices. Even if we wanted to compare ryokans and hotels along this pilgrimage, there is very little information available online in English. Yes, in the bigger cities you can see photos and read reviews of places, but for the most part we go completely blind with no information, and we made a decision to be happy with what we get. We noticed that with very few exceptions, being happy with your choices creates such a peaceful state of mind. 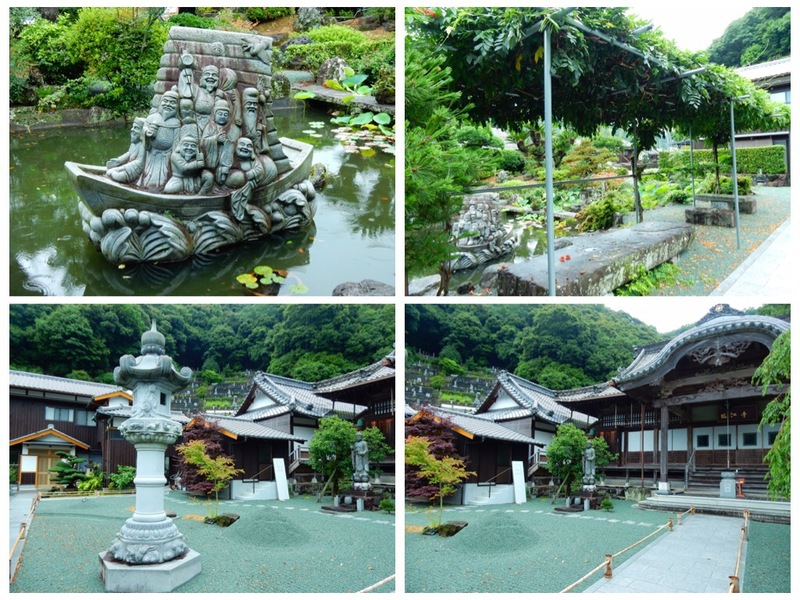 Before we left Tsushima town, we visited a beautiful local temple which is not listed as one of the 88 of the Shikoku pilgrimage. It had beautifully manicured grounds and a weeping willow tree. We had scheduled a short walk for today, mostly so we could space the walking for the next few days more evenly. We decided to walk today only to Uwajima city, and to rest for the balance of the day. Because we had time today, I decided to look for Tabi shoes, the traditional split toe shoes worn only in Japan. Tabi Shoes have been traditionally worn by gardeners, construction workers, farmers, painters, road workers and rickshaw pullers, since the late Meiji Period (1868-1912). They are also worn during festivals, and by traditional Japanese musicians such as the Taiko drummers. I love the sleek designs and comfortable fit of the Tabi Shoes, they are so cool. The traditional fastening of these shoes is a series of metal clasps (called Kohaze) that hook into a series of loops. The soles are made of pliable natural rubber which is soft and flexible, but stiff enough to protect the wearer’s foot from ground debris. We entered a shoe store but they had none of this traditional footwear. The salesman apologized and suggested a store up the road. We found the shop and I tried the shoes on, and found a white pair in my size. Now I have to carry one more thing in my already full to the brim backpack! It felt so wonderful to have a leisurely day. We sat in a cafe, walked slowly, choosing to walk along a scenic canal lined with old wooden houses, and down a covered shopping street that had a collection of festival masks of a Demon Bull. Since she spoke good English, we asked her the names of the masks that we saw and she said they are called Ushi-Oni which means Bull-Demon. There was a mask maker in the covered street who invited us into his shop and explained a little about his process. The masks are made of papier-mâché and feature long horns, long hair and golden teeth. Every July a big Ushi- Oni festival is held in Uwajima. Among the festivities are Ushi-Oni teams parading and dancing down the streets to the town’s song, known as the “Gaiya” dance. Beside the traditional dancing, there is a bullfight. The difference between the Uwajima Bullfighting and the more widely known Spanish bullfighting, is that in Uwajima, there is no Matador, but just two bulls fighting in a ring until one bull’s knees touch the ground or flees. Bullfights are generally held during the year in January, April, July, and August. The city is filled with these awesome Bull Demon masks. Shops sell t-shirts or towels and souvenirs with the Bull Demon on them. We checked into our hotel in Uwajima early. We had booked a room in the Clement hotel. The Western Style room that we were initially given, was smelly and furnished with old furniture. We paid a little extra and asked to move to a Japanese style Tatami room. The Japanese style room was awesome. We left our hotel and went to have lunch in a lovely cafe we had seen on our way in, called the Tao Cafe. The woman owner made us delicious pastas, brewed coffee in glass lab tubes, and had fabulous homemade cakes. We ate like hungry pilgrims. We even returned to her place in the evening for dinner. For dinner we ordered two pizzas, but she only had one pizza crust left. Instead, she made us a delicious pasta dish with vegetables and offered it to us as a gift. It was so kind of her. We stopped and bought a small bottle of bleach, so I can sterilize our collapsible water bottles. Because we fill them with water or tea daily, they never get a chance to dry out, and I had noticed that mildew was forming inside one of the bottles. I tried cleaning it with warm water and soap, but it did not look clean. Since we had time today, I sterilized our bottles and washed them well. We also bought a point and shoot pocket camera for Jules, because he had left his very good but heavy camera at the hotel in Tokushima, along with the rest of our extra luggage, which we will pick up on our last day in Shikoku. Jules adds: “I haven’t been shooting any photos since we left Tokushima at the beginning of the pilgrimage, because of the size and weight of my Olympus Stylus. It is so much fun to start shooting with the tiny Canon we just bought, and so easy to put the camera in any available pocket when I need my hands free. I enjoy very much seeing with a photographer’s eye, and for the remainder of the pilgrimage I will! We talked today about the fact that being a pilgrim is not at all easy. In the photos it might look awesome, with all the beautiful temples and the scenic landscapes, but walking for such long distances every day with a heavy pack on your back, is very hard. You pass through smoky tunnels and by many factories, there are weather conditions that are not favorable and in some places, people are not so kind to pilgrims, but see us as strange beggars. While in most places the people of Shikoku respect pilgrims, we have heard that beggars have been roaming the path and people are tired of their panhandling. There is always kindness in most people’s eyes, but some people avert their eyes, until they see our “Foreign faces,” and then they know that we are not beggars. It still feels a bit disheartening to be looked down upon, while we are aiming for exactly the opposite of what they suspect we are doing, and we actually need nothing that they have to offer. We are not looking for alms, or favors, or even kindness, but to rise above all our human needs and to discover the fountains of strength, power and endless joy that are within us. Jules told me that he was surprised to discover that most Henros are poor and doing the pilgrimage with no money, relying on Osettai (gifts for pilgrims) or free places to stay. He said he always thought of the pilgrimage as a mindful, physical and spiritual discipline and challenge. After all… The Buddha had given up on his rich life as a royal Prince, to become a wandering yogi and to discover his own True Spiritual Nature, beyond the world of appearances and illusions….why not us?…..